LET’S FACE IT: EVERY ELECTION IS IMPORTANT so get out to vote. This year’s election will shape not only our future as Americans, but also the future of our entire planet and its citizens. And with global temperatures rising, heat records falling, and the stakes getting higher and higher, is there any hope for a sustainable future? Fortunately, yes! Expanding clean energy, creating more green jobs, and ensuring a safe and healthy future for all of us. These are goals Americans agree on – and we need our leaders to support. 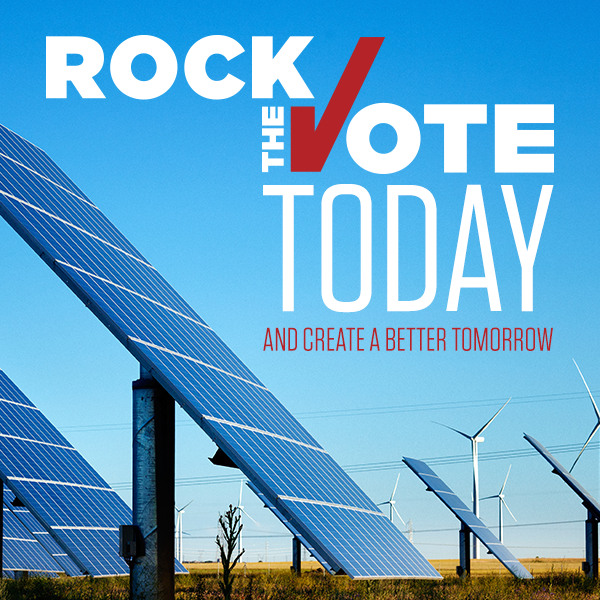 That’s why we’re making sure to #RockTheVote and taking action today to create a better tomorrow. Make Sure Your Voice is Heard This Election. Pledge that this year you’ll be informed, volunteer, register to vote, watch a debate, show up to the polls, or encourage your circles to get out there. In fewer than five minutes, you can register to #RockTheVote and proudly raise your voice on Election Day. Please attend any and all Rock the Vote events near you and please get everyone you to know get out to vote. Go Vote. It is time to speak out with your vote. More that important this year to Vote. It is crucial for our democracy.